Operational exigencies are common and happen to every airline. 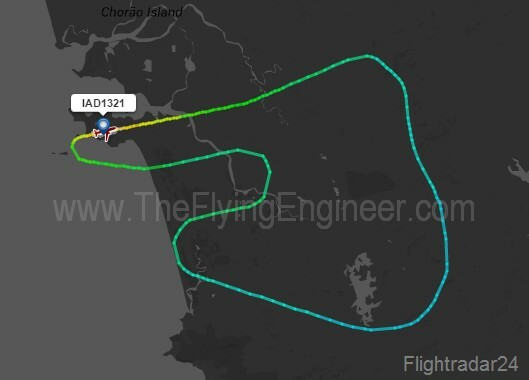 Last evening, one of AirAsia India’s five aircraft, registered VT-BLR, Airbus A320-216 (bearing serial number 4070 manufactured 6 years ago), while operating I5 1321 – the Goa to Bengaluru flight – returned to Goa immediately after departure, as it reportedly suffered an engine bird strike on departure. The aircraft returned safely to Goa, where it remains grounded at the time of writing. A second aircraft, VT-ATB presently based out of Delhi, operated I5 2327, the scheduled Delhi-Goa afternoon flight. On landing at Goa, it operated 1321 – the Goa – Bengaluru flight. The aircraft later performed a late night ferry (non-commercial flight) from Bengaluru to Goa, and then carried the Goa-Delhi passengers, landing at Delhi at nearly 3:30am. VT-BLR’s temporary grounding had affected the airline’s network. The previous night’s Bengaluru-Vishakapatnam-Bengaluru and Bengaluru-Cochin-Bengaluru flights, which were to have been operated by VT-BLR, were delayed by around 3 hours and 1 hour, respectively, as other aircraft (VT-ATF, VT-JRT) had to operate these flights after finishing their usual patterns. The pattern of only one of five aircraft: VT-RED based at Delhi, was not affected. As a result of VT-BLR’s grounding at Goa, today morning’s Bengaluru-Jaipur-Bengaluru (I5 1720/1721), and the afternoon Bengaluru-Goa-Bengaluru (I5 1320/1321) have been cancelled, while the evening Bengaluru-Jaipur-Bengaluru (I5 1722/1723) flights have been delayed by at least 2 hours. Training flights on VT-JRT at Bengaluru’s HAL airport, conducted last night, were not affected. The aim of this entry is to study how the airline handled an incident, and the effects of such an incident on the network, and not to comment on or judge its ability or methodology.